The knee-ear posture or Karnapidasana in Hindi is an advanced inversion yogasana attributed with the benefits of deep spinal flexion and intense stretch of the hips. Going by a sequence, this advanced feat comes after the considerably challenging Halasana. Therefore, to be successful in this posture, one must master the preceding expertise level asanas, mainly Halasana and Sarvangasana which are also partly present in Karnapidasana. 1. Since the karnapidasana position is basically an advancement over the Plow pose or Halasana, you must begin in it as well. Form out on the mat in the Plow pose with your shoulders tucked to the underside. You are at the liberty to either keep your hands flat by your side on the floor or interlace them behind your back. 2. Start bending your knees and haul them on the floor to either side of your head which should now be carefully bent at the neck and fixed with chin to the floor. 3. Let your feet rest on the floor with the heels up and toes touching the ground. 4. At this point, feel your knees close by your ears. Press them hard together, while feeling the thrust on the ears. This effectively cuts the aural distractions and thus, quite literally executes the Pratyahara principle of Ashtanga yoga.Pratyahara refers to the disengagement from sensory experience or in other words, external stimuli. 5. When you decide to release, let go of your arms first, slowly rolling out of the posture, perceiving disentanglement vertebra by vertebra. Breathe strong and deep as you come out. Approximately five breaths. Note: The head is subjected to a lot of weight in the karnapidasana yoga. It is advisable to avoid turning the head from side to side once you have formed into the posture. To ensure this, steadfastly fix your gaze ahead. You can modify the karnapidasana yoga posture with more support for your torso. ● Support the back with interlaced hands propped behind the spine. ● Infusing balance and comfort, keep a block behind your head to rest your feet upon. ● Maintain your knees at forehead level and bring up your hands folded to the ears. ● For some instant energy burn, get out of the posture in an Ashtanga-Vinyasa Style Jumpback Somersault. This is chakrasana. Loosen off your arms from behind your back. Fold up the elbows and situate your hands right under the shoulders. Coil up your toes to the underside. Press straight into your palms and feel your arms straighten. Follow this up with a nice back roll into Downward Dog. Reaching a Deep Concentration Level By Disengaging from Aural Stimuli: Everyone of us has felt it at some point. External stimuli can continuously bombard us with an overload of sights, sounds, information, misinformation, and make it hard for the mind to nestle in peacefulness. What’s worse, we become so accustomed to this overkill that our mind may just be addicted to it! As a result, we are continuously and voluntarily opting to hook on to our networking and media devices. Yoga states a caution against such distraction from mindfulness and asks us to follow reasonable refrains. In order to connect to our deepest selves, we must sit back and un-tune from everything and turn more to inner listening. This forms the pratyahara tenet of Ashtanga Yoga.The yoga karnapidasana posture allows the practitioner to literally disengage from the environment by means of ear obstruction and the head shelled up between the knees. Thus, these brief moments at the zenith of the posture can build undisturbed concentration. Builds Great Fortitude in the Spine: Karnapidasana steps avail many key spinal movements in the practice. The most impactful of these is flexion of the spine. The movement arches the spine downwards and to the front, giving a nice long stretch to the posterior chain. In this advanced posture, the degree of fortitude enhancing flexion is way more than in the Cat Pose or Child’s Pose. Digestion Improvement with Intestinal Backrub: The overarching spinal column stretch in this posture also means a deep massage of the internal organs, especially, the intestine. The fold at the stomach should send your digestive juices raving, bringing up the metabolic rate sky-high. With better digestion and better digestive glandular activity, a variety of skin related karnapidasana yoga benefits will be coming your way. Soft, glowing, clear skin are natural outcomes of a proper digestive cycle! Tones the Rear and Thighs: The legs down, buttocks up high point of yoga karnapidasana is a super formula for rear toning and stretching of the thighs. Keep up at this pose for 5-7 minutes and you are definitely going to come out with more character in your buttocks. Creates Pressure on the Thyroid Gland: The thoracic cavity and thyroid glands are recipients of a gentle but useful thrust. Healthier hormone secretion is one of the top benefits of Karnapidasana and reason why it should be on your posture curriculum list. Stay clear of this practice if you are going through menstruation, menopause or loose bowel syndrome at the moment.Since the karnapidasana steps are extremely exacting for the neck, keep safe in case of a sustained neck injury.Leg support with props is advised for cases of Asthma or high B.P. 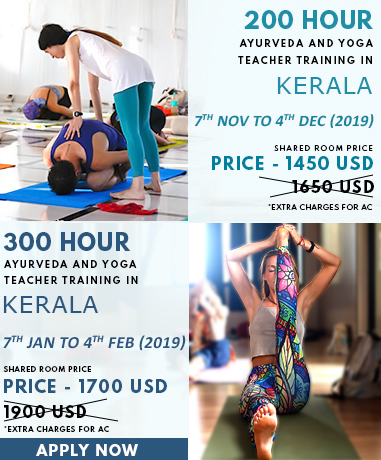 To Know more about Karnapidasana, join yoga teacher training in India.